Peace Corps Online: Cows and culture: Roger Dix spent his two-year service teaching English in Khust, and signed up for a third year when he married a fellow teacher, Neyla. Cows and culture: Roger Dix spent his two-year service teaching English in Khust, and signed up for a third year when he married a fellow teacher, Neyla. 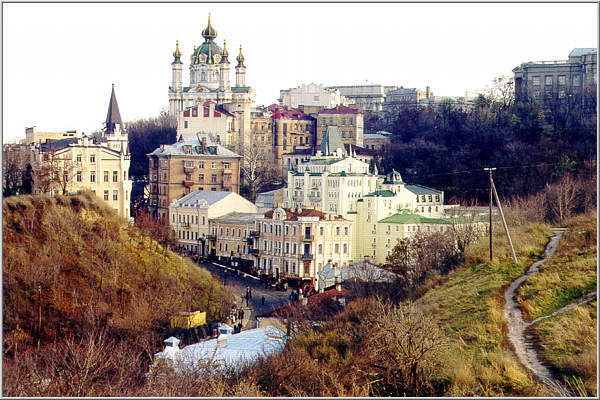 Peace Corps Online: Directory: Ukraine: Peace Corps Ukraine : Web Links for Ukraine RPCVs: Cows and culture: Roger Dix spent his two-year service teaching English in Khust, and signed up for a third year when he married a fellow teacher, Neyla. Cows and culture Silence was the first thing Roger Dix (B.A., International Relations, '90) noticed about his apartment in Khust, Ukraine. The only sounds in the apartment were those Dix made himself: no television, no radio. The first day he woke to the sounds of bells. "I looked out the window, and there was a farmer herding cows across the street," he recalls. "On the street where I lived." Dix had traveled in Central and Eastern Europe, but never to the countries of the former Soviet Union. His Peace Corps assignment to Khust fulfilled his desire to live in the mountains in the western part of the country. Dix spent his two-year service teaching English in Khust, and signed up for a third year when he married a fellow teacher, Neyla. They met shortly after Dix arrived in Khust, and Neyla helped him with language and cultural skills. In Ukraine, teachers dress more formally than in the United States. "The women usually wear some kind of nice dress with some kind of nice shoe," explains Dix. "They wear nice shoes even though the streets are so horrible. The men often wear suits to class, and I was dressed like an American." Neyla told him the kids and the teachers would respect him more if he dressed better. Dix changed his style. Dix became well known in town as "the American." Running for exercise is a rare thing in Ukraine. When Dix began his morning runs through farm trails, the farmers would stop and stare. After a while they would only glance and say, "Oh, yeah, that's the American running." Dix taught high school students. Other teachers would have him come into their classrooms to teach subject-related material in English. During the Ukrainian elections, he taught students about American elections. He formed a drama club, and he involved students in sports. Is Roger Dix still there? (There is no date posted on the web page.) Who, if any, are the current Peace Corps volunteers there? Does the Khust high school still have a resident/senior English teacher named Katerina?